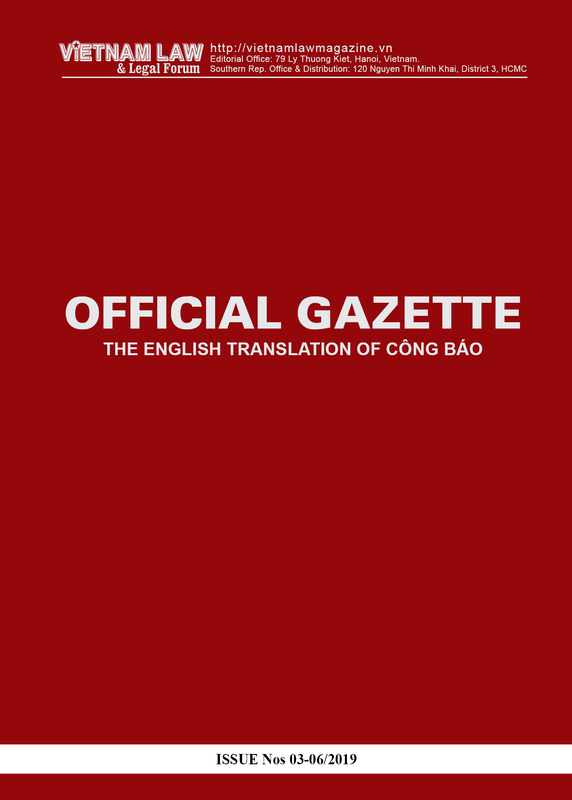 The Communist Party of Vietnam Central Committee has recently issued Resolution No. 18-NQ/TW on continued renovation and rearrangement of the apparatus of the political system and Resolution No. 19-NQ/TW on continued renovation of the organizational system and improvement of the quality and efficiency of public non-business units. 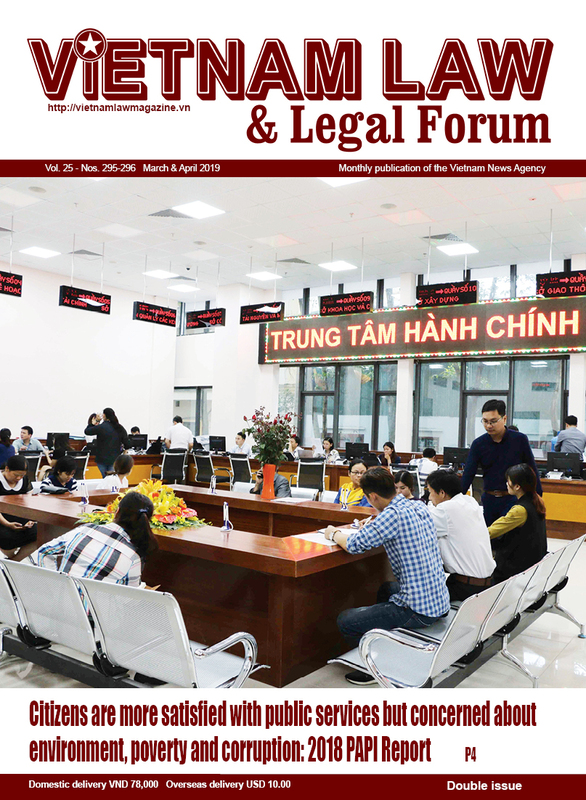 Vietnam Law and Legal Forum would like to introduce the article by Chairman of the National Assembly of the Socialist Republic of Vietnam Nguyen Thi Kim Ngan which suggests specific solutions for improving the legal system on the organization of the state apparatus in the spirit of these resolutions. The past years have seen the development of the views and institutions on the socialist law-ruled state of the people, by the people and for the people led by the Communist Party of Vietnam. At the same time, the country’s legal system has been also constantly built and refined to cover almost all aspects of social life, creating balanced and synchronous economic, political, social, national defense and security, environmental protection, human rights and citizens’ rights institutions to facilitate the sustainable development and international integration of the country. 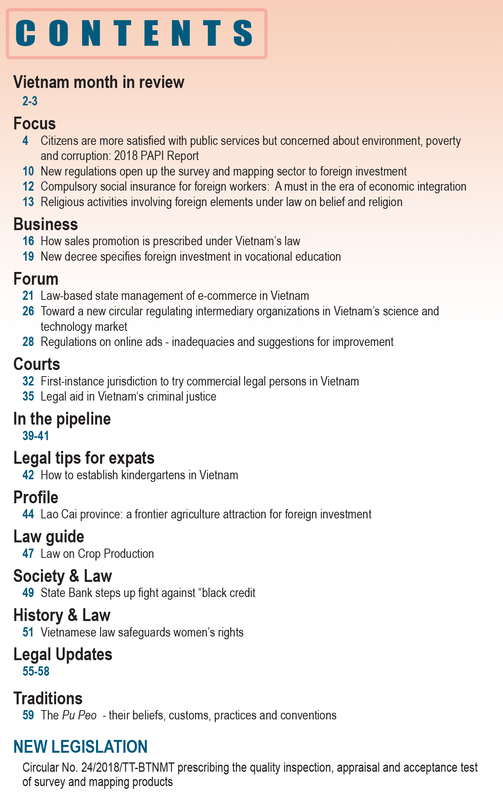 The Constitution of the Socialist Republic of Vietnam passed by the 13th National Assembly in 2013 has provided an important legal basis guiding the continued development and improvement of the Vietnamese legal system, particularly the laws on the organization of the state apparatus. The Constitution and laws governing the organization of the state apparatus have asserted legislative, executive and judicial powers; established basic principles for renovating and improving the state apparatus; ensured the assignment, coordination and control of powers among state agencies; and vested in the National Assembly, President, Government, people’s courts, people’s procuracies, and local administrations at all levels sufficient authority and responsibility for the management of the country. The National Assembly has passed more than 120 laws to concretize the 2013 Constitution, including about 20 laws specifically regulating the organization of the state apparatus. The National Assembly Standing Committee, Government, Prime Minister, ministers and heads of sectors have issued more than 200 legal documents defining the functions, duties and organizational structures of their agencies and units. The People’s Councils and People’s Committees at all levels have also attached importance to issuing legal documents according to their competence to materialize the policy of reforming the state apparatus in localities. The above-mentioned documents have helped strengthen the organizational apparatus and further clarify the functions, tasks, powers, responsibilities and working relationships of state agencies, step by step satisfy the requirements of the national construction and defense. The National Assembly has been fortified organizationally, and its operation has become more substantive with markedly improved quality. The Government’s organization has been further streamlined in a more rational manner with the formation of multi-sectoral and multi-field ministries. Local administrations have been initially distinguished in terms of organizational structure and tasks and powers suitable to rural, urban and island characteristics. Although the law on the organization of the state apparatus has been improved, many shortcomings still exist. According to the Resolution of the 6th Plenum of the Central Party Committee of the 12th Congress, the law on the organization of the state apparatus remains asynchronous and incomplete, having many conflicting and inconsistent provisions. Some legal documents not related to organizational structure still contain provisions that lead to the creation of new organizations or increase of the state payroll. This has led to the situation that the political system apparatus in general and the state apparatus in particular are still bulky and multi-echelon and have multiple agencies acting as focal points. The total payroll and number of people receiving salaries and allowances from the state budget continue swelling, especially in the non-business sectors. The number of people working part-time at the commune level, in villages, hamlets and street quarters, and people holding leadership and management posts also tends to increase. Some policies of the Party and provisions of the 2013 Constitution on the organization of the state apparatus have not been fully, specifically and promptly institutionalized. Functions, tasks, powers, organizational structures and relationships of some agencies and organizations remain unclear and overlapping. The assignment, coordination and control of state power among state agencies in the exercise of legislative, executive and judicial powers remain inconsistent and ineffective. Publicity, transparency and accountability are limited. Though the Constitution and Law on Organization of Local Administrations have established the principles of power division, decentralization and authorization, many specialized laws still fail to explicitly express the policy of promoting power division and decentralization, leading to the weak and inconsistent implementation of this policy. Even in some fields there has appeared a trend of power centralization into the central agencies. Legislation has not clearly defined the specificities of urban, rural and island administrations; local administrative units are generally small, many of them are not up to the set standards, particularly at district and commune levels. The mechanism to protect the Constitution and laws and strengthen the socialist legality still has inadequacies and limitations. In addition, sectionalism, for the interest of individual sectors, is still traced in the process of elaborating legal documents on the organizational apparatus of agencies; not a few leaders and advisory officials in charge of legislative work in some ministries, sectors and localities have not yet thoroughly grasped the spirit of reform, lacking determination and courage in their advisory work, so there are documents which are unrealistic, and slow to be revised. The responsibility to issue legal documents on the organization of the state apparatus has been assigned to many agencies, but the coordination, review and inspection work as well as the advisory role of the focal agency in charge of organization of the state apparatus have not yet been promoted. This is also the cause of the limitations in the improvement of the law on the organization of the state apparatus. Firstly, agencies and organizations in the entire political system from the central to grassroots levels should urgently work out programs and action plans for the implementation of the Resolution, clearly defining specific objectives, tasks and solutions. Secondly, in 2018 and 2019, agencies and organizations will have to complete the review of all legal documents concerning the functions, tasks, powers, organizational structures and working methods of agencies in the state apparatus for prompt revision or issuance of new ones. In the immediate future, efforts should be focused on reviewing the Law on Organization of the National Assembly, Law on Organization of the Government, Law on Organization of Local Administrations, Law on Cadres and Civil Servants, Law on Public Employees, Law on State Audit, Law on the Public Security Force, Law on Trade Union, among others, and report the results of the review and propose amendments to the National Assembly. For laws, ordinances and resolutions of the National Assembly and its Standing Committee for which the scope and contents of revision are clear and dossier and procedure requirements are satisfied, they should be reported to the National Assembly Standing Committee for submission to the National Assembly for inclusion in the legislative agenda. For matters which need to be further reviewed and studied, roadmaps for revision of relevant legal documents or issuance of new ones or plans for pilot implementation to provide a basis for revision of relevant laws should be worked out. Thirdly, on the basis of the review results, it is necessary to further study and complete the legal system on the organization of the state apparatus in the spirit of the 2013 Constitution and Resolution of the 6th Plenum of the Central Party Committee of the 12th Congress. The revision process must avoid incorporating regulations on organizational structure and payroll into laws, ordinances and resolutions of the National Assembly or National Assembly Standing Committee which are irrelevant to the state apparatus. In case of necessity, examination and impact evaluation reports must be presented to the National Assembly and its Standing Committee for consideration and decision. The Law on Organization of the National Assembly will be revised toward raising the quality and efficiency of the operation of the two pillars of the National Assembly: the Nationalities Council and Committees. It is necessary to reduce the number of National Assembly deputies concurrently working in executive agencies and specify the numbers and reasonable ratios between leaders, standing members and full-time members of the Nationalities Council and Committees of the National Assembly. The advisory and assisting organs of the National Assembly and its Standing Committee will be reorganized toward neatness and efficient operation; and the office of the National Assembly deputies’ delegation, office of the People’s Council and office of the People’s Committee at the provincial level will be merged into one. The Law on Organization of the Government will be revised with a view to streamlining the Government’s apparatus to operate effectively and efficiently after the model of a democratic, modern, professional and dynamic administration. The Government, ministries and sectors will focus on macro management and formulation of strategies, master plans, laws, mechanisms and policies. It is necessary to further study and clarify theoretical and practical grounds on the scope of multi-sectoral and multi-field management by a number of ministries and sectors, especially those with similar and overlapping functions and tasks, so as to come up with appropriate solutions for and carry out the consolidation and reorganization of these ministries and sectors. A number of tasks which are not required to be delivered by ministries, sectors or state agencies will be transferred to organizations, individuals or enterprises. The revision of the Law will be combined with the preparation of a project on the organizational structure of the Government for the 2021-2026 term. The division and decentralization of state management power between the Government and Prime Minister and ministries, ministerial-level agencies and local administrations and between superior and subordinate administrations will be promoted. The subordinates will be given greater autonomy, power will be associated with responsibility, and at the same time inspection, supervision and control of power will be intensified. In 2018, it is a must to issue all documents on the functions, tasks, powers and organizational structures of ministries, ministerial-level agencies and government-attached agencies and criteria for establishing sections, departments, general departments or directorates and equivalent units under ministries and ministerial-level agencies; and documents on criteria for classification and conditions for establishment of public non-business units in each sector and field. The Law on Special Administrative-Economic Units will be passed soon. The Law on Organization of Local Administrations will be reviewed and improved to clearly define the tasks, powers and responsibilities of provincial-, district- and commune-level administrations, establish clear mechanisms of decentralization and authorization of power between local administrations and performance of decentralized and authorized tasks and powers, and set the number of agencies attached to provincial- and district-People’s Councils and People’s Committees and the number of deputy heads of these agencies to serve as a basis for localities to implement the streamlining policy. The criteria for establishment of villages, hamlets and street quarters will be revised in order to reorganize these units and reduce the number of part-time cadres. Regulations on local administrations will be revised in the direction of taking into account differences in the organizational structures of urban, rural, island and special administrative-economic unit administrations. People’s courts at all levels will be reorganized according to their jurisdiction to suit the practical conditions, since the current organization of first-instance people’s courts mainly based on district-level administrative units is the reason behind the scattered arrangement of facilities, cumbersome apparatus and staffs. People’s procuracies will also be reorganized in alignment with the system of courts, attaching importance to their duty to exercise the prosecution power in investigation activities. Investigative agencies will be step by step reduced in number to meet the requirements of criminal investigation, crime prevention and combat and suit the organization and operation of people’s procuracies and people’s courts in light of the judicial reform. The functions, tasks, powers, responsibilities and working relationships of the State Audit Office of Vietnam will be reviewed and improved. 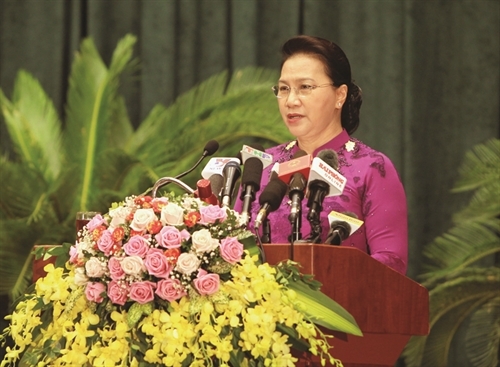 The tasks of the State Audit Office of Vietnam will be clearly defined, avoiding overlapping with those of related agencies and organizations, such as the Government Inspectorate, Inspection Committees of the Party Committees, and specialized inspectorates of ministries, especially in financial and public asset inspection. Therefore, it is necessary to revise the Law on State Audit to clearly define the scope, objects and areas of operation of the state audit, ensuring no overlapping with the tasks of other agencies. The Law on Cadres and Civil Servants, Law on Public Employees and implementing regulations will be revised to develop criteria for determining the number of civil servants, the number of employees in public non-business units, and the structure of civil servants and public employees of ministries, sectors and local administrations associated with the functions, tasks, powers, scope and nature of their work and the criteria of cadre and civil servant titles and based on the scientific and realistic determination of job titles. Regulations on the maximum number of deputy heads of state administrative agencies; documents on criteria for determining the number and structure of civil servants and public employees of ministries, sectors and local administrations; and criteria for evaluating the performance of cadres, civil servants and public employees will be improved and completed to serve as a basis for determining those who are to be removed from the state payroll. Fourthly, the Party Committees, state agencies and organizations from the central to local levels, especially their heads, must take the initiative in streamlining and strengthening their own organizational structures. This is in fact a process of “self-restructuring” in a proactive, creative and responsible manner based on criteria and regulations set by competent agencies, ensuring that the model and size of their apparatuses are compatible with the nature, characteristics, functions and tasks of each type of agency or locality in the whole political system. Ministries and ministerial-level agencies must have plans and proactively rearrange their internal organizational structures along the line of minimizing intermediate levels, reducing focal points, cutting staffs, reducing the number of deputy heads and equivalent titles. They will have to reorganize the organizational apparatus in those fields which are vertically organized or already decentralized to local administrations. No departments will be converted into bureaus or general departments; no new sections will be set up in advisory departments of ministries and ministerial-level agencies; special cases must meet specific criteria set by the Government. It is not necessary to establish subordinate agencies and organizations exactly the same as superior agencies and organizations and vice versa. Agencies and units at the same level in different localities will not necessarily have the same organizational structure. Any decisions on the establishment of organizations, and recruitment and appointment of personnel against the set criteria and standards must be withdrawn or cancelled. Fifthly, together with the review and perfection of the legal system and the reorganization and streamlining of the state apparatus, it is necessary to continue reforming the administrative procedures and computerizing the state administration, implement e-government and e-administration, renew working methods, reduce meetings and paperwork, and prepare other necessary conditions for the reform of the state apparatus. These laws include the Law on Organization of the National Assembly, Law on Organization of the Government, Law on Organization of People’s Courts, Law on Organization of People’s Procuracies, Law on State Audit, Law on Election of Deputies to the National Assembly and Deputies to the People’s Councils, Law on Oversight Activities of the National Assembly and People’s Councils, Law on Promulgation of Legal Documents, Law on the People’s Security Force, Law on Officers of the Vietnam People’s Army, Law on Organization of Criminal Investigation Bodies, Criminal Procedure Code, Civil Procedure Code, Administrative Procedure Law, Referendum Law, etc. For example, the establishment of legal, statistical, emulation and commendation or new countryside development support organizations, or sub-departments within provincial-level departments. By June 2017, there were 42 general departments and directorates in the whole country, an increase of 100% over the Government of the 11th term; 826 departments in general departments and directorates, up 4.7% over 2011, and 7,280 divisions in general departments and directorates, an increase of 4.7% compared to 2011. There were 750 departments, bureaus and equivalent units in ministries and ministerial-level agencies, up 13.6% over 2011; 3,970 divisions in departments, bureaus and equivalent units, an increase of 13% over 2011; and 10,226 divisions and equivalent units in provincial-level departments, up 1.1% over 2011. As of March 1, 2017, the number of people receiving salaries and allowances from the state budget was 3,958,251. The total number of people receiving salaries and allowances from the state budget in public non-business units was 2,294,251. The number of people receiving salaries and allowances from the state budget at the commune level, in villages, hamlets and street quarters was 1,266,503 people, accounting for 32.7%. According to statistics of the Party Central Committee’s Organization Commission, there were 81,492 deputy heads (from deputy ministers to deputy heads of district-level sections) among 375,442 cadres and civil servants from district level upward (accounting for 21.7%). For example, Construction Law No. 50/2014/QH13 stipulates that the authorities competent to grant construction permits include also the Ministry of Construction, while Construction Law No. 16/2003/QH11 only vested this competence in the People’s Committees at all levels; Public Investment Law No. 49/2014/QH13 does not delegate the power to appraise investment capital of group-A projects to local authorities but concentrates this power in the Ministry of Planning and Investment. According to Plan No. 735-KH/DDQH14, dated January 18, 2018, on the performance of the tasks of the National Assembly’s Party delegation already determined in the Resolution of the 6th Plenum of the Party Central Committee of the 12th Congress.